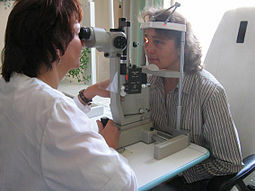 Ee examination wi aid o a slit lamp. Ophthalmology is the brainch o medicine that deals wi the anatomy, pheesiology an diseases o the eebaw an orbit. This page wis last eeditit on 12 Februar 2018, at 08:34.